My first experience with a long haul flight introduced me to a different beast entirely and I was utterly unprepared. Now, I was no unseasoned flyer. I’ve been flying interstate since I was a baby and always relished the sport of it. The heart yammering gauntlet of the security check, hoping your boots don’t set off the metal detectors, scouring of the food court for something acceptable to eat, the mad dash to one’s departure gate, hoping that you’re at the right one, and at glorious last handing over your boarding pass to sit in one’s seat, jovially stashing your carry on in the overhead bin, politely introducing yourself to your fellow passenger, and flipping through the in flight magazine as you dutifully listen, for the thousandth time, to the safety instructions seamlessly demonstrated by the flight attendants. Flying, for me, was enjoyable, and its own marvelous adventure, even in the stressful moments. Even taking into account the flights with terrifying turbulence, or the one I spent next to a person with the most appalling body odor I have ever encountered even unto this day, whom I’m also quite certain stealthily alleviated herself of a considerable amount of gas throughout the trip. Having always enjoyed flying, I assumed that a long haul flight would be even more fun. But after arriving at LAX jet-lagged, dehydrated, and incredibly stressed after listening to a toddler shriek uncontrollably for eight hours of the flight, I realized I had not sufficiently prepared. The flight home was even more stressful. I was crammed behind a man who reclined his seat all the way back, roughly tossing in his seat every few minutes so that it was impossible to have a drink on my tray without it spilling all over me. I had to sit with my legs crossed in my seat. Plus, I was on the window seat, so I had to wake not one but two heavily sleeping passengers every time I needed the bathroom. You can guess how often I felt game to disturb them. On arrival, instead of reclining on the beach in Cairns with a margarita like I had planned, I ended up needing medical attention for a suspected blood clot. In short: the inevitable misadventures that are “part of the fun of it” on a short flight still occur on a long flight, it’s just that “fun” becomes a far less accurate word to use. My research since has proven that I did almost everything wrong before my first long haul flight, and many of the difficulties that I encountered could have either been prevented, or at least minimized, with a little preparation and self care. I put together this comprehensive list in the hope that it helps you prepare for the long haul flight to your next great adventure, and also because I feel like it will make my next experience a lot more enjoyable. Subscribe to our newsletter to receive The Anxious Introvert’s Guide to Travel, packed with 70+ tips for making your next trip stress free. You know how you see those Facebook ads for $99 flights to Greece? Pass. Whilst those deals look good on the surface, they usually only cover a one way base fare. By the time return airfares, taxes, baggage, food, in-flight entertainment, and seat selection are added, the price is comparable to the larger, more comfortable airlines. Comfort is another factor to take into consideration: there is very little leg room on budget airlines. This is how they work: they charge less per ticket, but cram in more passengers and charge a hefty premium for things that are standard ticket inclusions on the larger airlines. Further, budget airlines tend to be more susceptible to flight delays and cancellations. This is not usually a deal breaker if you’re only nipping two hours down the road. But on a long haul flight, service, seating, entertainment and leg room are precious. If these things don’t faze you and you just need to get to Bali on the cheap, go for it, but for long haul travel we find it’s better to scout fantastic prices on premium airlines. We love to use Budget Air to find the best deals. The seating is more spacious, you will enjoy more perks, and there is less potential for being sat next to a crying toddler (though this can still happen). More leg room is reason enough to spring for it, if it is within your budget. If you want to avoid the likelihood of flying with a large number of families with children, fly at times that would be inconvenient for said families. Flights between 12 am and 6 am are often cheaper, and are more likely avoided by families because it involves keeping the kids up to the point of overtired, unruly and nigh unmanageable by the time they reach their destination. Also, pay attention to school holidays, as these periods are more popular for families. Check in well before you go and select your seating. This usually opens up 24 hours before takeoff and we recommend it every time. If turbulence bothers you, you’ll feel it least sitting on the wing. Choosing an aisle seat means you can get up whenever you want (but it also means you have to get up whenever anyone else wants). You should also choose an aisle seat if you are at risk of DVT. If you need more leg room, choose the exit rows or the bulkheads, but you need to be able bodied to assist with evacuations. Provisions for cots and bassinets are made at the front of the plane, so this is where parents with infants are more likely to be seated. Bear in mind that some airlines, particularly budget airlines, will charge for this, but in our opinion, it is well worth the expense. If you don’t follow this step and leave it to the Fates, any number of things can happen. On our honeymoon Greg and I didn’t pre-book our seating and were allocated seats on the opposite end of the plane to one another. Luckily, the dream team at Qantas were able to rearrange things for us, but it was a game of Tetris to do it and this isn’t always possible. Being squished with a bunch of strangers at those high altitudes, in a de-humidified, pressurised, icy cold cabin for 12+ hours can wreak utter havoc on your body. Getting sick, DVT, jetlag, puffiness, and general malaise are all common side effects from airplane travel. To boost circulation, ensure that you come prepared. Eat a nutritious, balanced diet in the days leading up to your flight and try to do some light exercise before you board. Remember, you’re going to be sat still for a long time up there. Walking and doing yoga are great choices – just don’t go overboard to the point of muscle soreness. Make sure all the devices you intend to bring with you are fully charged before you go, and bring an external power device so you can charge on the go. Many airlines now have USB charging ports fitted to the seats, but it pays to be prepared just in case your plane does not. Don’t bring so much carry on that it starts chewing into your leg room. Remember, on a long haul flight, every centimeter is precious. Store as much carry on in the overhead bin as you possibly can. In-flight entertainment sure has come a long way in recent times, but if your screen doesn’t work, or your headphone jack is broken, you’re screwed. This is why we always advocate bringing back up entertainment. Take full advantage of the download option on Netflix and load up your Kindle with good books you’ve been dying to read, so that an entertainment screen on the fritz doesn’t turn your long haul flight into a boredom nightmare. On our flight from Brisbane to LAX, I was admittedly kind of impressed by the lung capacity, vocal prowess, and emotional commitment of a small girl, around three or four years old, who managed to shriek at the top of her lungs in a full scale meltdown for the better part of 8 hours of our flight. Her parents were able to ignore her and enjoy their flight in peace thanks to their top of the line noise cancelling Bose headphones. For the rest of us, however, the standard issue airline headphones did little to muffle the sound. Whether you yourself have the misfortune of one of these incidents, or perhaps instead you are sat next to (God forbid!) a snorer, or a chatterbox, a pair of noise cancelling headphones are an absolute non-negotiable. Of course, nothing drowns it out like a pair of Bose headphones, but if they’re out of your budget and/or you want to get some shut eye, I’ve heard great things about these Sleep Phones, which attach to your head like a headband and allow you to sleep in maximum comfort. I do also recommend ear plugs. It’s amazing how far this goes to helping you feel (and smell) fresh throughout your flight, particularly if you plan to kick off your shoes. Also (take this from someone who has had to endure it) nobody wants to sit next to a stanky passenger. Even 2 hours is a literal hell of a long time to be sat next to someone with body odour, let alone 12+. Are you a DVT risk? Risk factors for DVT include history of blood clots, DVT, or stroke (including family history), recent surgery, cancer, heart disease, overweight, pregnancy, hormone replacement therapy, smoking, or Pill use. If you have one or more of these factors, don’t take it lightly. I was on the Pill up until recently before my flight, and I have a family history of stroke. I really thought I was safe until I had my clot scare. I always recommend visiting your GP prior to travel, but it is especially important to talk to your GP about DVT risk prior to travel. Your GP may recommend a particular type of compression stocking, or medication, prior to your flight. Do not self medicate. I now travel with class 1 compression stockings – make sure you talk to your GP or pharmacist about which level of compression stocking is right for you, as ill fitting compression stockings can cause problems too. Though some people would argue that getting on a long haul flight tired will help you sleep, it does nothing to help with jet-lag. If for some reason you cannot sleep on the plane, all it will mean is that by the time you arrive at your destination, you will be absolutely fried. So, get a good night’s sleep the night before and if your plane leaves late at night, schedule in a little 15-20 minute nap earlier in the day (not too close to when you have to leave for the airport!). This will help you feel refreshed and rested and if circumstances prevent you from falling asleep on the plane, you won’t already be behind the 8 ball. Sync your phone’s clock to that of your destination. If it’s sleepy time over there whilst you’re on the plane, try to sleep as much as you can. If it’s not, try to stay awake. This will help your sleep cycle to calibrate. Yes, international flights will often give you a pillow, but if you’ve read our Tips for Staying Healthy While Travelling, you’ll know that they probably aren’t hygienic to sleep on. Instead, bring your own travel pillow. These have come a long way in recent times, and there’s a pillow to suit every preference. This one is my favourite. Use the pillow that the airline supplies as a lower back support. Trust me on this. It’s heavenly. And don’t forget a sleep mask - I love this gel one. It’s like a pillow for your eyes. Melatonin is the natural sleep inducing chemical produced in the body, and helps to set your circadian cycles. A little spritz under the tongue about 15 minutes before you plan on falling asleep will help make awkward plane sleep easier. I keep a small roller ball of lavender oil with me and rub this on my temples, between my eyes, and a bit on my travel pillow, to help me stay calm and fall asleep. My favorite time to get some shut eye is right after the meal cart has come around and I’ve finished my dinner. This way I’m ensured the maximum stretch of time in relative undisturbed silence before it rattles past again. It also means that by the time I wake up, the post-meal bathroom rush is over, and the aisles are relatively free for me to do some stretching exercises. Unless you suffer from severe travel anxiety, try to avoid taking sleeping tablets. 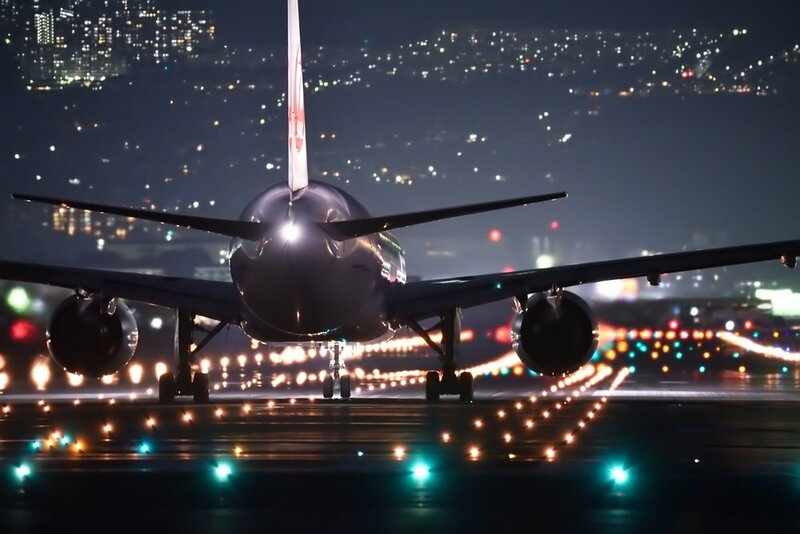 Not only can this disrupt your circadian rhythms even more, exacerbating jet lag, but it can also increase your risk of DVT due to knocking you out cold for the entire flight and not getting up and moving around. Unless you’re Kim Kardashian, it’s highly unlikely that your airplane outfit is going to be photographed and splashed across every magazine in town... and even SHE has been known to rock up the airport in a tracksuit. Now is NOT the time for skinny jeans you need a coat hanger to wrangle into. On our flight to LA there was a family sitting a few rows up from us who boarded the plane in matching Peter Alexander Disney jammies. They looked so adorable, like they were all off to a slumber party. Just before the seatbelt signs came on for landing, they changed back into their day clothes and disembarked with a spring in their step. That family was very wise. Avoid starchy, heavy jeans, digging in waistbands, underwire bras, or tight shirts. Think loose, flowing comfortable layers in breathable fabrics. Ladies, bralettes and wire free bras are your best friends. If you’re doing the “wear your bulkiest clothes on the plane” trick to get away with carry on, fine – but have some silk pajamas rolled up in your handbag that you can change into on board. Layer with a soft, warm cardigan or a hoodie. It can get very cold up there. A big pashmina scarf doubles as a blanket on board, so you don’t have to use the airplane ones. Alternatively, a Turkish towel is an indispensable travel resource for various reasons, and comes in especially handy for use as a blanket on your flight. In Traditional Chinese Medicine, they believe that when your feet are cold, your whole body gets cold, so it’s important to keep them warm on the chilly airplane. They also believe that having warm feet aids circulation. If you decide to kick off your shoes, make sure you’re wearing a pair of fluffy socks to keep your feet toasty warm. However, have a pair of flats or put your shoes back on to visit the bathroom for hygiene reasons. Airplane travel is without exception the safest way to travel. However, emergencies do happen. Not to mention people are swept up in their own little world, and in small spaces, toes get stepped on – literally. For this reason, always wear closed toe shoes on the plane. Your feet will swell during the flight, so choose shoes with some give, like lace up sneakers, rather than tight boots. Let’s face it, flying can be a stressful experience at the best of times. You’re trapped in a tiny tin can with a bunch of strangers, thousands of feet in the air, for half a day or more, skipping across time zones, in a cold dehumidified environment. It will do a number on your nervous system, so giving yourself Zen time isn’t a nice-to-have, it’s a must. For that reason, now is not the time to watch the latest horror movie or crime thriller, which only aggravates your nervous system response. Choose entertainment that makes you laugh and feel good. We love watching Modern Family and 30 Rock while we fly, and if there’s a Disney movie on tap, I watch it every time. Music wise, I like to Zen out with easy listening like Michael Buble, the La La Land soundtrack, or listen to affirmations and meditation music. Deepak Chopra’s Soul of Healing Meditations, or Gabrielle Bernstein’s Meditations are my favourites, or some motivational Tony Robbins seminars. You could also catch up on the books you’ve been dying to read, do some colouring, knock out a crossword puzzle, and simply take this rare opportunity to do nothing. Such opportunities to indulge in nothingness come along so infrequently in today’s busy world. To keep healthy circulation and prevent DVT, keep moving. Ensure that you are getting up every two hours and moving around (without obstructing other passengers or the flight attendants, of course). Walking lunges, squats, and a walk up the aisle and back are enough to keep your body engaged in healthy movement. Every hour that you’re awake, try to engage in at least four minutes of exercise in your seat. I love this Yoga with Adriene Desk Yoga video that easily translates to an airplane seat, or you could follow this fantastic guide. I cannot stress enough how important it is to move as often as you can and forget about worrying other passengers. They too should be getting up and moving around anyway. You are trapped in a metal tube with a bunch of strangers for an extended period of time and you’re all in it together. You have literally no choice. Being kind to others and remembering that everyone on that plane is on their own journey goes a long way in making your flight more enjoyable. Introduce yourself to your flight attendant. Say please, and thank you, and get to know their names. Trust us, it goes a long way. Introduce yourself to the fellow passengers in your row and spend a moment or two getting to know them. If you can see a mum struggling with a fussy baby or toddler, offer to help out as much as you are comfortable with and give her a break to calm her nerves. Even offering her a sympathetic smile goes a lot further than a rude comment or complaining to the helpless flight attendant. You may just have the magic touch to calm the infant down and save the entire flight experience for everybody. Hey, it takes a village. Be the person that makes a long haul flight a little brighter rather than more stressful. As in all areas of life, a tiny act of kindness on your part can make the world of difference to someone else. Having some non-liquid snacks on hand is always a great idea. My favourites are preservative free dried fruit, a BSc protein bar, Babybel cheese, candied ginger, and 85% dark chocolate. This will make ALL the difference. Have a glass of water for every hour you are in the air. I also like to drink a glass of half pineapple juice, half coconut water, and a pinch of salt before I head to the airport. The sugar, salt and electrolytes help to keep me extra hydrated and it’s far less processed than sports drinks. You’re flying, dammit! It’s a celebration. You’re either off on a grand adventure, or coming home from one. One glass of alcohol or two with dinner helps to make the flight festive and calm your travel jitters, just go easy. Too much alcohol will add to jet-lag, make you sick, dehydrate you rapidly, and impair sleep. Stick to one or two glasses throughout the flight and make sure to have two glasses of water for every alcoholic or caffeinated beverage. You probably wouldn’t have a hot coffee or a big glass of Coke right before attempting sleep at home, so why do it in the air? If you stick to the above rule of sleeping when it would be sleep time at your destination, caffeinate when it would be morning at your destination, like you ordinarily would at home. Stick to just one cup of coffee or Coke, as caffeine is dehydrating. Make sure to bring some chewing gum on board. Whilst I don’t ordinarily ever chew gum, chewing it during takeoff and landing can help to prevent your ears from popping, and it can also help to settle your nerves, particularly if you choose a peppermint flavor. The serving sizes for drinks on aircraft are tiny. By the time you’ve taken a sip, half the glass is gone. Ask for two drinks at a time so that the flight attendant doesn’t have to keep coming back and forth. It’s not the best time to start a Keto diet right before you travel. Foods rich in carbohydrates have been shown to help to prevent jet-lag. Higher levels of insulin can help to make the transition from one sleep routine to another easier. Choose healthy sources like rice noodles, oats, white Basmati rice, sourdough bread, potatoes (all varieties), and fresh fruit. At such high and cold altitudes, your digestive system function is slowed and impaired, so where possible choose foods that are easily digested. Raw, cold foods like nuts and raw veggies can be harsh on your gut. Cooked foods and simple carbohydrates, served warm, are a lot easier to digest. Foods with warming properties, like ginger, are also good to have on hand. Airplane travel is extremely harsh on your skin due to the cold dehumidified environment. It can make you look 100 years older on arrival. Make sure to slather on a heavy night cream before you go, and slide on a lip balm to stop your lips from cracking. I also like to bring a microfibre face cloth, dampen it with water and put it over my face while I’m sleeping to help prevent dryness and puffiness. Before landing, a little travel sized rose water spritzer bottle is a must have. Give your face a quick spritz to instantly restore moisture and keep you looking fresh. I’m not usually big on hand sanitiser, but on a plane where there are a lot of germs floating around, it’s a must. I sanitise my hands before meal times and as a secondary step after washing my hands on the plane. I bring antibacterial Wet Ones with me and use them to wipe down my seat, serving tray, arm rest and seat belt before sitting down. Here’s why. It is estimated that you have a 10 to 80% chance of getting infected with a virus from your fellow passengers on a flight. No, thanks. Bring some Berocca tabs, some Frequent Flyer Health Boost tabs, or Airborne tabs if you’re USA based. These are effervescent tablets you can pop into a glass of water which deliver a hit of immune protecting vitamins. Drink one just after you take off and one right before you land to help to protect your immune system. Save the tea bags from a green tea or a herbal tea (keep them somewhere sanitary), let them go cold, then pop them over your closed eyes just before you land to keep your eyes looking fresh. Alternatively, you can press ice cubes to your under eye area to relieve puffiness. Keep a clear quart sized zip lock bag with some travel sized (no greater than 100 ml liquid) toiletries. Before landing, excuse yourself to the bathroom use these to freshen up. Brush your teeth, rinse out your mouth, cleanse your face, and moisturise your face and arms. Give yourself a quick Wet Ones “shower” and deodorise. Ladies, if you feel like it, apply a little BB cream under your eyelids, mascara, and lip gloss. You’ll feel a million times fresher and ready to arrive in your destination. Long haul flights can be just that ... a long haul. It can feel like you’ve run a marathon by the time you’ve reached your destination. But like any marathon, the journey can become a lot easier, and even more enjoyable, with a little prior preparation and know how. We hope these tips have helped you in preparing for your next adventure. We would love to hear your best tips for flying. Do you have any tips that should be in this list? Let us know in the comments below. Cancelled flights, lost luggage, or unexpected illness can turn your dream vacation into a nightmare super fast. That’s why we never travel without insurance for peace of mind. Our friends at Tick Travel Insurance take good care of us when we travel and we highly recommend them. So you got off your plane, jet-lagged, disoriented, and confused, and now you have to work out how to get to your hotel. Jayrride really takes the stress out of our arrival by helping us to compare and book transfers from the airport worldwide. Looking for the products we talked about in the story? Here’s where to find them. Charge all your electronics on the go, even in the air. Towels have a multitude of uses while travelling, especially as a more hygienic travel blanket to use on-board. Drown it all out with these badboys. Prevent blood clots and DVT and improve circulation.